This is actually hotter than your average pepper spray because they start with a hotter base formula. They use a 3 Million SHU base, 50% hotter than the average pepper spray out there. That should tell you something. And besides that, its proven to be hotter on that standard. We have independent laboratory tests to prove it. All of the above pepper sprays are effective. For the most part, the above SHU amounts are overkill and only one measure of quality. However, all other things being equal or close to equal, the Wildfire has got to be some very hot and effective pepper spray. Do not waste your money on inferior brands when it comes to saving your life, because I am selling these at very low prices anyway. And, at these prices, you cannot go wrong. OK, this unit is the small half ounce pepper spray in a hard plastic shell that is refillable. The output is a stream pattern and can shoot 6 to 8 feet effectively (actually a little more) for 6 to 10 short bursts. This dynamite Wildfire formula also contains UV identifying dye to help mark your assailant. The plastic molded keychain has a belt clip and comes with a keyring. Comes in Black, Red, Blue and Pink. 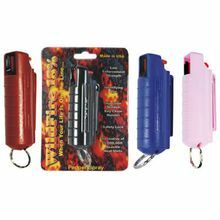 Sorry, no Wildfire pepper spray orders to New York, Massachusetts (need FID card), Michigan, Wisconsin, Hawaii or Alaska.